With only five ingredients, these cookies are easy AND delicious! 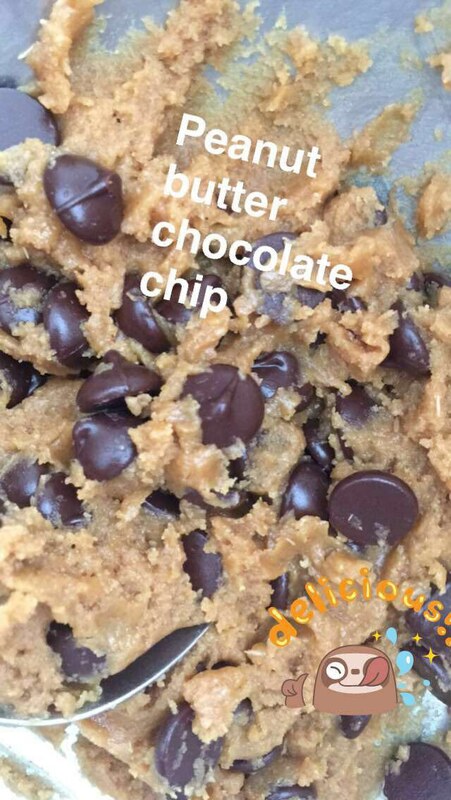 I absolutely love baking, and my favorite thing to bake are cookies. However, I HATE dealing with a lot of ingredients, especially flour. It gets everywhere and makes a mess. So whenever I find a recipe that doesn't involve flour, I jump right on it. These peanut butter chocolate chip cookies really do taste AMAZING, even without flour. They're soft, chewy, and bake up really well - no unnecessary spreading or weird things happening in the oven. And with only five ingredients, they're super simple! Preheat the oven to 350. Mix 1 cup of peanut butter (it's best to use regular Jif and not all-natural, as you need the salt as a stabilizer and the sugar for sweetness), 1 cup of brown sugar, 1 egg and 1 teaspoon of baking soda altogether in a bowl. The peanut butter is a little tricky to measure out because it's so sticky, but the mixture combines really fast and easily. I didn't even need a mixer - stirring worked just fine. After that mixture is well combined, fold in your chocolate chips. I found I only needed about half a bag, and even that was a ton of chocolate chips. On a parchment-lined sheet, make little cookie balls (I was able to get 2 dozen). Bake for about 12-14 minutes, then let cool. Because of the high fat content, these cookies need to sit and cool for awhile before they're sturdy enough to come off the baking sheet. And that's it! These cookies are simply, quick, and DELICIOUS!